The Genie Outside The Bottle. The judges look tired, interrupt every once in while, but let the Yushchenko’s team guy finish. Channel 5 interrupts the broadcast from the Supreme Court midway through the questions from Yanukovych’s team guy, switching live to Yushchenko’s address at Independence Square. the resignation of Yanukovich’s campaign manager Serhiy Tihipko – The Kyiv post notes that some oligarchs – notably Kuchma?s son-in-law Viktor Pinchuk, valued at $3bn, may be ready to switch sides, while others, notably Rinat Akhmetov, reportedly Ukraine’s richest man and in “complete control of the Donetsk oblast”, do not yet appear to be ready to deal. Although his relation to Mr Yanukovich has not been friction-free, Mr Akhmetov has significantly supported Mr Yanukovich’s presidential campaign. Allegedly, he met him on a Kyiv airfield last Wednesday, complaining about his lost “venture capital”, and punching Mr Yanukovich in the face before leaving. It is still unclear (certainly to me) to which extent the “secessionist movement” is based on true popular support in the East, and to which extent it is (merely) an element of a game plan by oligarchs who may or may not be able to correctly judge their ability to put the genie back into the bottle after the the power struggle is over. At the very least, it seems to me, the centuries-old ethnic/religious and linguistic cleavage will become an even more pressing problem in the future. Below, I have superimposed a couple of maps relating to the question. 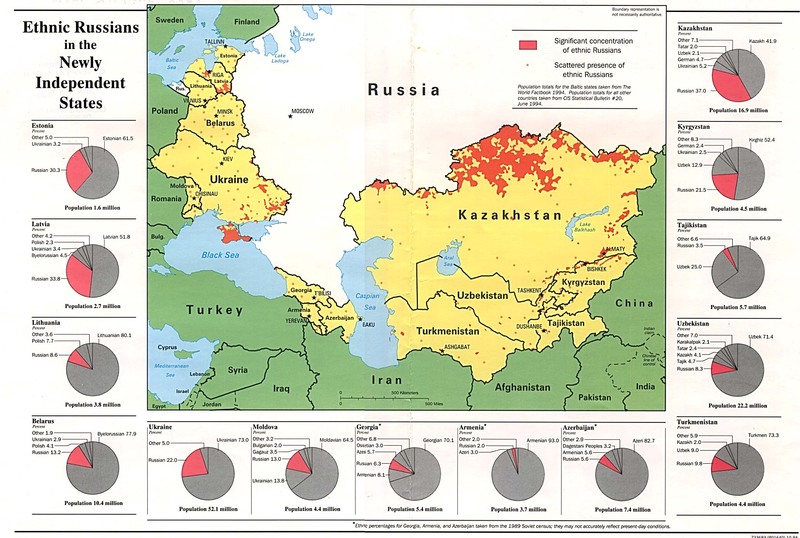 The difference of the two areas may explain why the CIA map refers only to 22% of Ukrainians as ethnic Russians, while “opinion polls conducted in 1994-1998 by the Institute of Sociology of the National Academy of Sciences in Kyiv show that the proportion of respondents who said that Russian was their native language ranged from 34.7 percent to 36.5 percent,” according a report by “The Ukrainian Weekly”, published in 2000. While Russian seems to have lost some ground – particularly in the educational system – since Ukrainian independence, once again referring to the article quoted above, “between 1994 and 1999 the proportion of Ukrainians who chose Russian as their language of “convenience” increased from 43.5 percent to 50.9 percent.” It seems to me that the most pressing linguistic problem may be a status issue: the recognition of Russian as an official language. So there may be a chance to put the genie back into the bottle. This entry was posted in A Fistful Of Euros, Ukraine and tagged akhmetov, ethnicity, independence, language, Russia, Ukraine, ukrainian, yanukovich by Tobias Schwarz. Bookmark the permalink. Good points about the issues of language. I note two things. First, while there was incredulity about the above-90-% Yanukovych vote in the easternmost oblasts, we can see similar percentages in the Westernmost oblasts (with the exception of the one oblast that belonged to Czechoslovakia and before that to Hungary) for Yushchenko. So I think the division is very real, and the magnitude of election fraud is not necessarily in the double digits (of voters’ percentages). Second, on that blue ethno-linguistic border. As I wrote on my blog, it might make more sense to represent Ukrainian territorial differences with a three-way split, rather than a two-way one. There is Western Ukraine: Western Christian, originated as the Halic (Galician) kingdom, later history as part of either Poland-Lithuania, Poland or the Habsburg Empire, and the birthplace of Ukrainian nationalism. Then there is the Central-North: onetime center of Russia smashed by the Mongol invasion, later Cossack territory and at times in Lithuanian control, Eastern Orthodox. Finally, the South and Southeast are territories where nomadic tribes passed through for centuries, with the Mongols as the last one, whose heirs were the Tatars – this area was conquered and re-settled (with settlers from both from ‘Ukrainian’ and ‘Russsia proper’ areas) by Russia from Peter The Great until the Crimean War. One more thing: unfortunately, I don’t think that quote from Neeka’s blog indicates a ‘freeer’ press. While Neeka and fellow Orange(wo)men can certainly be happy that the media at last covers their side of the story, cutting away from the Yanukovych side presenting its arguments to a Yushchenko protest sounds not ‘free’ but bias turned around 180%. I hope this is just one event and not a new pattern. On the bright side, the peaceful mingling of Blue and Orange protestors Neeka described in an earlier post are just… fascinating. I suspect whichever Viktor ends up on the losing side will eventually concede “in order to protect national unity”. It’s a dignified way out. Thanks for providing the map — it is more informative than the “standard” BBC orange-blue one. DoDo: as far as I know, the late Vyacheslav Chornovil, a prominent Ukrainian nationalist politician, identified nine key ethnocultural regions of Ukraine and at some point suggested that the country become a federation of those. The Western areas (E. Galicia, Volhynia) might have been the cradle of modern Ukrainian nationalism within Austria-Hungary, but the North-Center has a stronger claim to being the country’s core. With Kyiv at its heart, it was indeed at least one of the birthplaces of Ancient Rus’ and the entry point for Orthodox Christianity; much of the debate between Ukrainian nationalists and Moscow is about who is the rightful heir to Kievan Rus’ (as if there had to be only one). A century after the Mongols destroyed Kyiv, Lithuania easily annexed the North-Center; Galicia and Volhynia were divided between Poland and Lithuania in the 14th century. Then Poland merged with Lithuania; in the late 16th century Western Ukrainian areas converted (not without political pressure from Polish authorities) to Catholicism of the Eastern Rite. Most Orthodox subjects of the Polish crown (Ukrainians and Belarusans, to use our terminology retroactively) saw this conversion, the so-called Unia, in a rather negative light. This division is still important. As the Orthodox Ukraine, again centered around Kyiv, resisted Polish attempts at Catholization in the 16th and 17th centuries, the so-called bratstva — communities or fellowships of Orthodox believers — emerged to promote solidarity and education. I would say these were the seeds of civil society in Ukraine. I’m sorry, but I have to object to DoDo saying that Kyiv was the “one time centre of Russia.” Kyiv was the centre of Kyivan Rus. Just as Ukraine, per se, did not exist at the time, neither did Russia. It would be more appropriate to say that Kyiv was the one time centre of Slavic civilization.